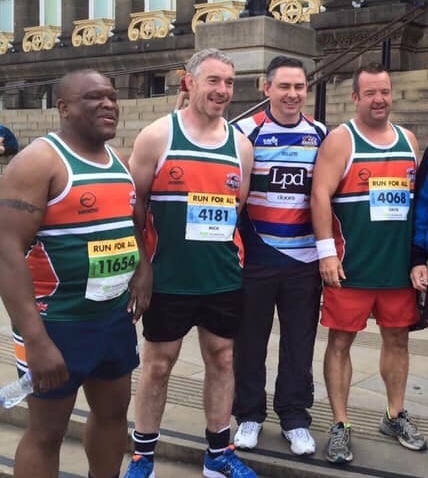 Four of Hunslet’s favourite sons will be taking part in this year’s Leeds 10k to raise funds for the Hunslet Rugby Foundation. You can join Club legends David Brooke, Richie Baker, Mick Coyle and fans favourite Steve Pryce on Sunday 7th July for what promises to be a special occasion. The cost of entry is £25 with a commitment to raise a minimum of £30 sponsorship. All team members will receive a special Hunslet race day t-shirt as well as a free ticket for the afternoon game against Newcastle Thunder. Local running club South Leeds Lakers are also inviting team members to join their Tuesday night club runs to help with training. Self appointed team captain ‘Stevo’ is looking forward to the challenge “I ran the race in 2015 with only 2 weeks of training. “This time I’ll be well prepared and show the lads a clean pair of heels. “Joking aside it will be great to be back in Hunslet colours and supporting the Foundation with their work in the South Leeds community’. To register interest in joining the team email Phil Hodgson at hodgieleeds@aol.com.